Sure, you can buy premade pita chips, but why, when these are so easy to make? Seriously, it’ll take 20 minutes tops, from the time you grab the cutting board to when you’re scooping the golden triangles onto the cooling racks. Then there’s the flavor. They’re homemade, so you have no artificial ingredients or preservatives. These have a firm crunch but aren’t oily at all, as some of the packaged versions can be. The zatar lends a mild Middle Eastern flavor, but you can use the same technique with any seasoning you prefer. Sometimes we just sprinkle them with a little grated parmesan and a few grinds of pepper. Make sure you use real, splittable (it is so a word!) pita bread. 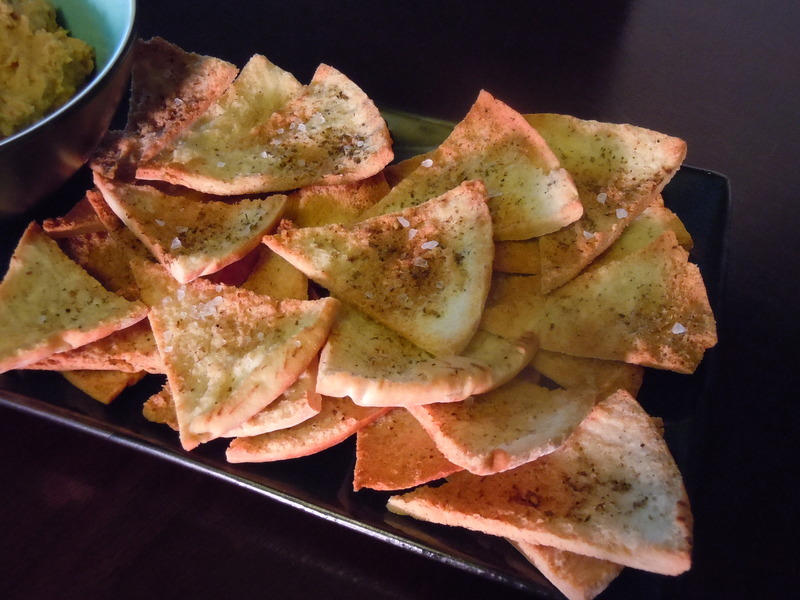 Some recipes for pita chips use unsplit pita wedges, but I think they’re too thick, and are too dry and hard when toasted. 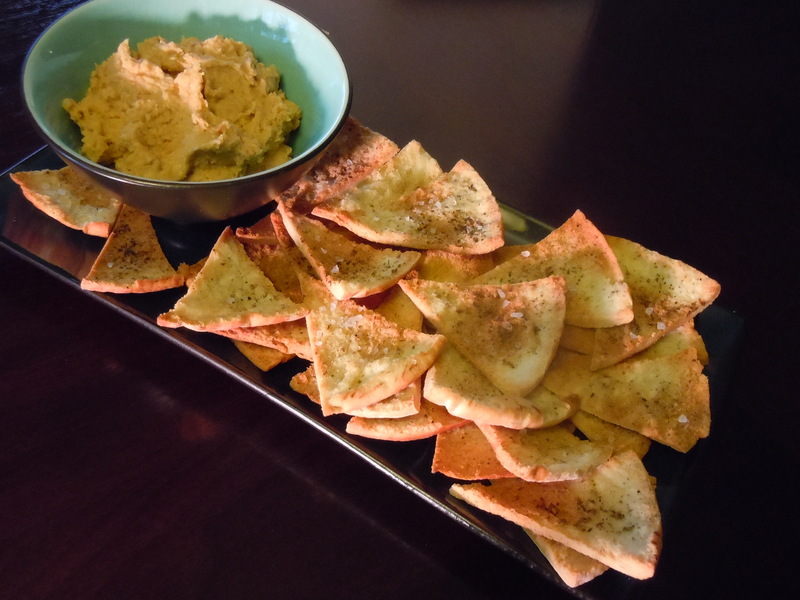 They’re great with the (store-bought) hummus pictured below, or nearly any dip or spread. Heat the oven to 400 degrees F. In a small bowl, stir together the oil, zatar, fine sea salt, and pepper. Cut each pita into 8 wedges (you can stack a few and cut them together). With your fingers, carefully split each wedge apart. Set them, insides up, on a cookie sheet in one layer. You may need to use two cookie sheets or work in batches. Brush each wedge lightly with the zatar-seasoned oil. Sprinkle each one with a few large salt crystals. Bake for 9 to 11 minutes until they’re golden; this will result in a crunchy, firm chip. If you prefer them softer, with a bit of chewiness, cut the baking time down to 7 minutes. Cool on a rack. They’ll keep for several hours just out in a basket, or can be stored at room temperature in an airtight container for several days. This entry was posted in appetizers, baked goods and tagged chips, grated parmesan, pita, zatar. Bookmark the permalink. Great timing! We are spending Christmas day with a Syrian friend of mine who is making grape leaves. She will love these – so will we. Enjoy! You really can make these a day or two ahead. And one of these days I’ll make my own hummus and post about it. I’ve made these before! They don’t last very long! Yours look BEAUTIFUL! Getting back to my favorite bloggers after Christmas Day. These chips look very tasty and easy to make….just the perfect New Year’s Day snack. Thanks.